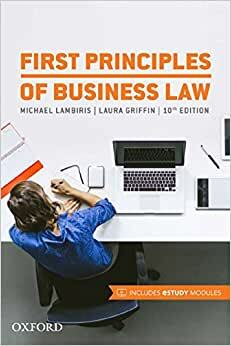 First Principles of Business Law provides an integrated learning approach to studying business law, and offers a succinct and authoritative explanation of the system within which business law operates.This textbook is easy to navigate, with well-structured headings, flowcharts, glossary of terms, tables of cases and legislation, and index. Extracts from key legislation are included, and summaries of reported cases illustrate key concepts of business law.The eStudy modules complement the textbook and will help students develop their ability to apply business law in practical situations. The modules improve learning and understanding through hundreds of carefully sequenced examples, questions and short case studies, giving instant feedback to answers. There is a supporting module for each chapter of the textbook. Sample the eStudy modules that support First Principles of Business Law.